Grate 2 tablespoons peel from limes. Cut each lime in half crosswise; squeeze halves over small bowl to remove 6 tablespoons juice. Place melon cubes in 1-gallon resealable food-storage plastic bag. Sprinkle lime peel and pour lime juice over melon. Add sugar, rum and mint. Seal bag; turn to coat melon. Refrigerate at least 1 hour to blend flavors but no longer than 24 hours. 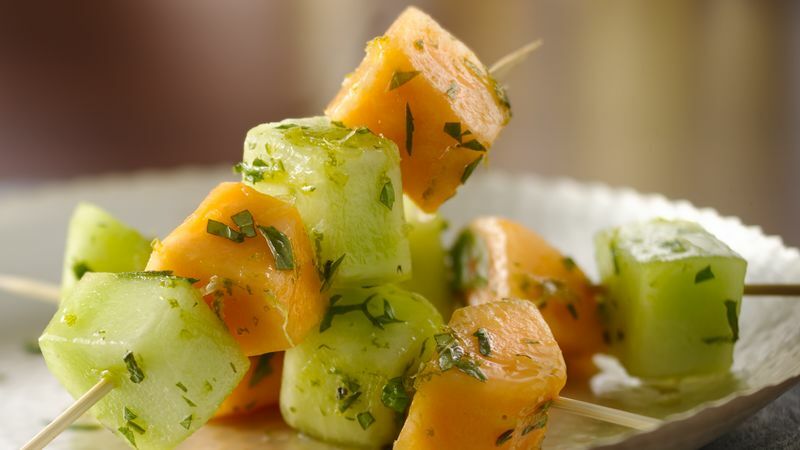 To serve, thread 4 or 5 melon cubes on each skewer. Discard marinade. "Mojito" typically refers to a cocktail made with lime juice, sugar, mint leaves and rum. We've taken those same flavors and turned them into a refreshing appetizer. One-third cup frozen (thawed) limeade concentrate can be substituted for the rum.